Hello and welcome to my first craft session for Christmas 2014! It’s early but we all know how fast the time goes…before we know it Thanksgiving will be over and the race to Christmas will have started. 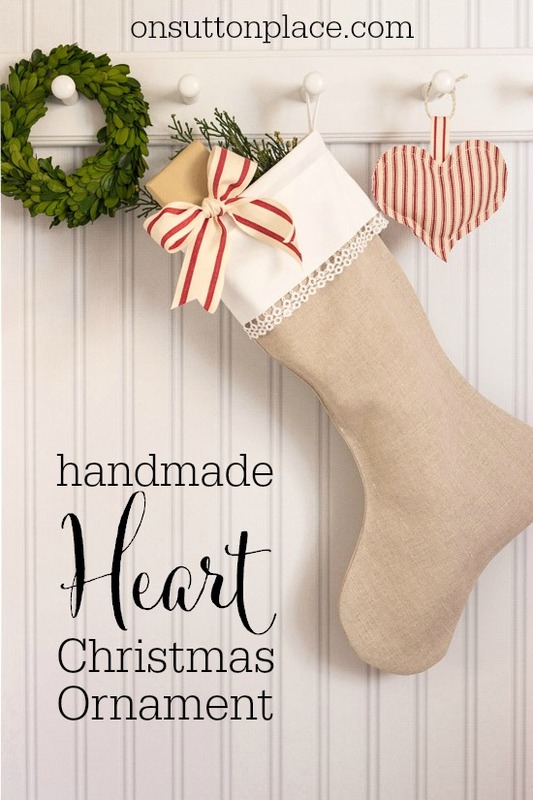 I thought I would try to get you some easy, handmade Christmas tutorials early enough so you would have plenty of time to create. Creating in a rush is really no fun. 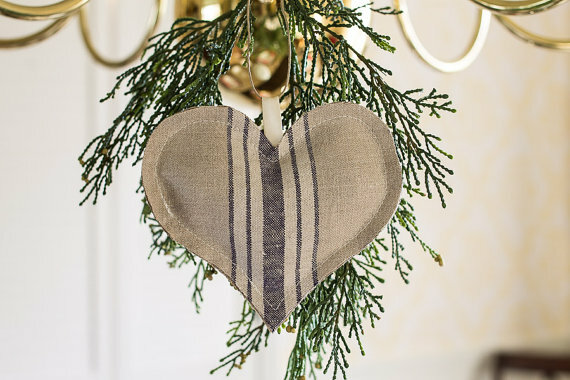 This heart Christmas tree ornament involves sewing but I promise it’s very simple. Use them as tree ornaments or as lovely add-ons to your gift wrap. It’s a great way to use up left-over fabric but fat quarters would be easy too. You could coordinate several different fabrics. Let’s get started! 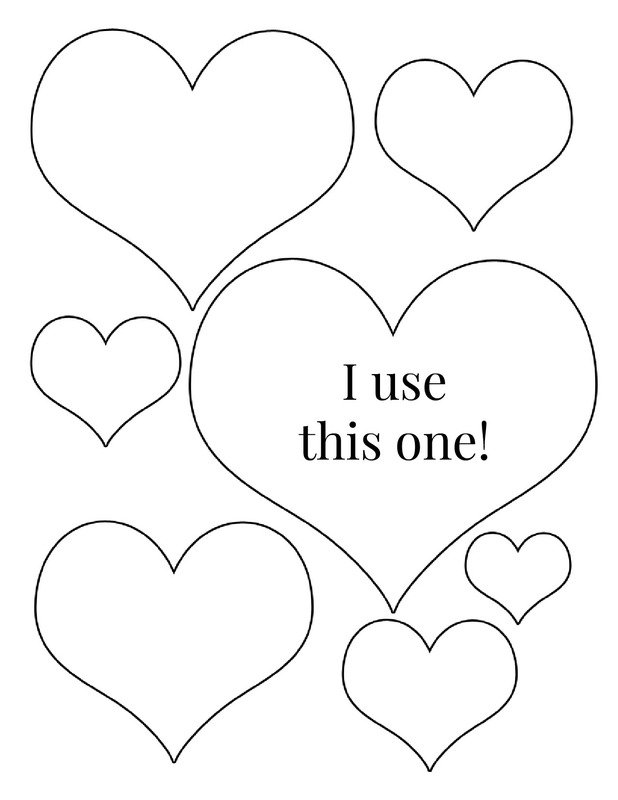 The first thing you need is a heart template so click HERE. This link will take you to the template I use. Just right click>>save as. After you have saved it, go ahead and print. Cut out the size(s) you want. 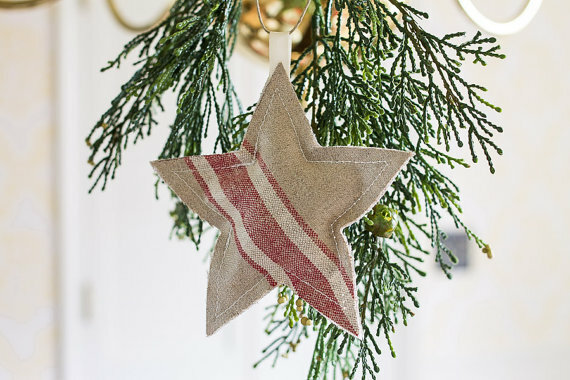 Helpful hint: if you are planning to making several of these ornaments I highly recommend making a template out of cardboard. It is much easier and quicker to trace the heart with a sturdy template. The directions I’m giving are for one ornament. Again, if you plan to make several it’s quicker to use the assembly-line method. 1. Cut 2 pieces of fabric approx. 6 in. x 6 in. (This is for the heart size specified on the template.) Trace a heart on ONE piece of fabric. 2. Cut out the heart. Make sure to cut INSIDE the heart so your tracing line doesn’t show. 3. With WRONG sides together, place the 2 pieces of fabric in your sewing machine. Note where I started sewing…on the right downward curve of the heart. Using your presser foot as a guide, sew along the edge of the heart. 4. When you get to the top of the heart, bury your needle, lift the presser foot and insert your ribbon hanger. Continue sewing. (Back stitch if needed to make sure your needle has caught the ribbon.) Stop about 2 inches from your starting point. This will allow a gap to insert the polyfill. Remove the fabric from your machine. 5. Insert a tiny bit of polyfill. I just take little blobs and insert them with the end of a wooden spoon. 6. 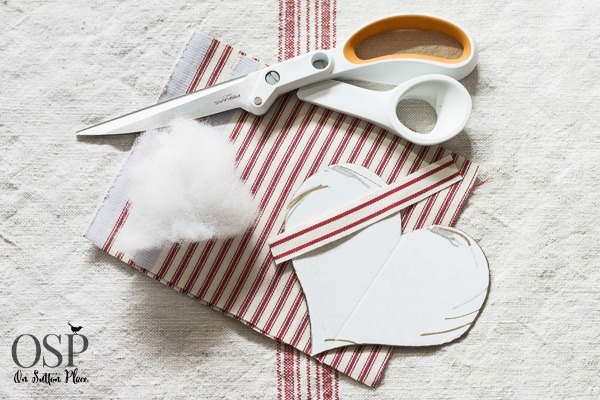 Put the heart back in your machine and close the gap with stitches. I use this method to make all the ornaments for my shop. It’s so much easier than trying to sew 2 hearts together and keep them lined up. Try to use a sturdy fabric that won’t easily fray. You could also make different shapes like stars or stockings. I’ll be back in touch on Saturday with my monthly newsletter. If you haven’t subscribed yet there is still time! Just fill out the box right below my signature. 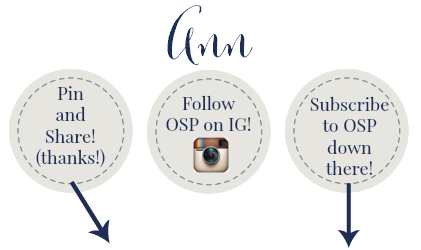 I’ll have shop updates, November news and of course the subscriber-only monthly free printable. See you then! So simple, yet so pretty! I LOVE this idea! It conjured up an idea for little Christmas gifts to share. Make the heart and include your beautiful directions in the package for the receiver to continue giving. A nice little present for my granddaughters and my quilter co-workers. They would all love it!!!!! These are so darling Ann. What a simple yet charming gift for someone. Ann, I just love these! And your photographs, as always, are just so pretty. I am looking forward to all of the good things you will be sharing with us between now and Christmas! This is so cute and so clever how you attach the back. Thanks for the tutorial! Thanks so much for sharing! I enjoy all of you creativity! Thanks for the easy to follow tutorial. I enjoy the ones I’ve gotten from you; I may just have to reacquaint myself with my sewing machine and try my hand at some. Thanks,looks pretty easy,can’t wait to try it. Have a great day. Love it! Is there a template for the star? The stocking is so pretty also. Ann, this is a genius way of making the hearts! So much easier than trying to keep two cut out pieces together! 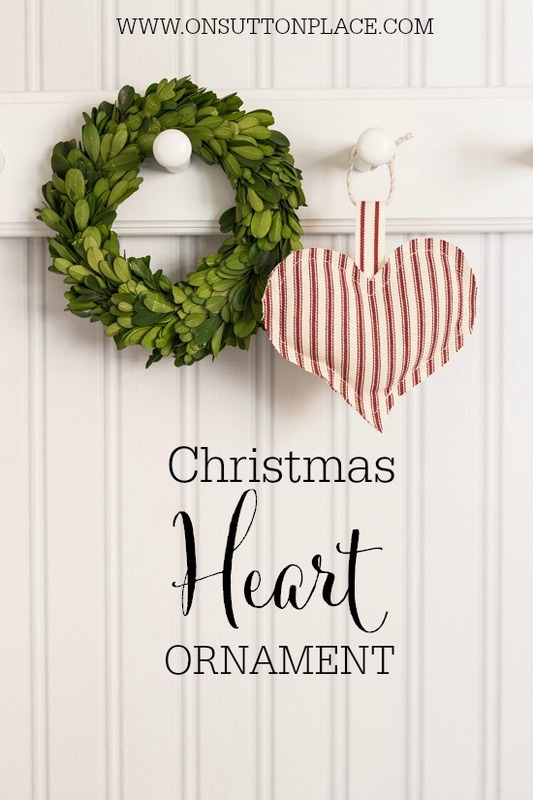 I just pinned the cutest wreath made from similar hearts so I’m pinning your tutorial on how to make these heart-shaped ornaments! I know Jane! It was like a light bulb moment when I finally figured it out. Thanks for stopping by! So adorable, I am going to make bunches of these! Great tip on how to sew them, thanks!! This is a wonderful tutorial! Easy and very timely. 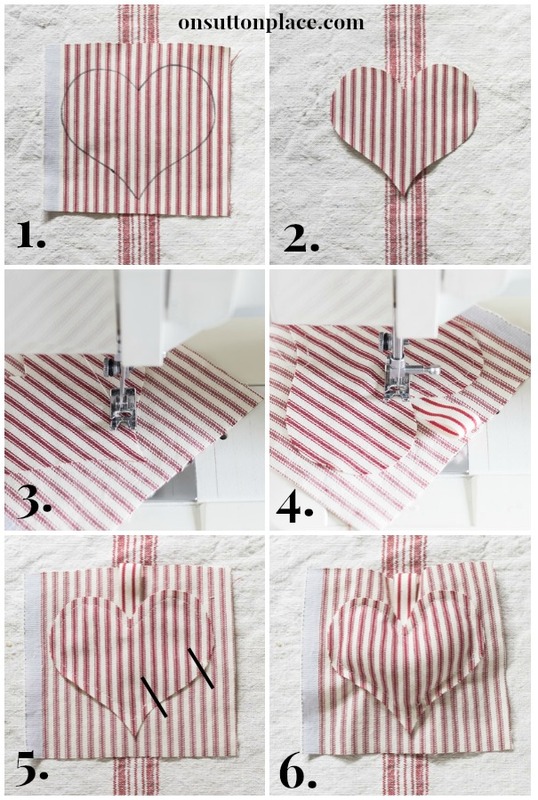 I WILL dig out my banished sewing machine and make some of these! Just adorable!! I’ll make several of these on Saturday when we’re supposed to have rainy/cold weather – perfect indoor craft project. Thanks, Ann. I got right on your site today without all those warning popping up! Whooo Hoooo- and it popped right open this time. Anyway- that is a great idea! I have always cut out both hearts and done them that way. You are sooooo smart. Those are darling. I always do heart “something” at Christmas. I’m sorry you are having trouble…my site is checked all the time and I promise it’s 100% secure. Thank you for letting me know you stopped by! I need to stop being so scared of my sewing machine. These are adorable! haha…don’t let it intimidate you! So pretty Ann! 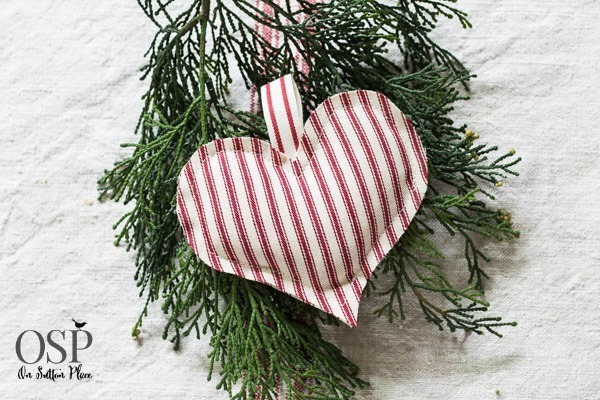 I love the Christmas ornaments and I can see they are made with love.